NETWORK FINALS: CBS’s NCAA TOURNAMENT telecast adjusted to 1.3/1.3/3.0 (the latter hour being the Duke game), compared to 1.4/1.1/2.4 on last year’s parallel night. Elsewhere, DYNASTY dropped 0.1 in final numbers. 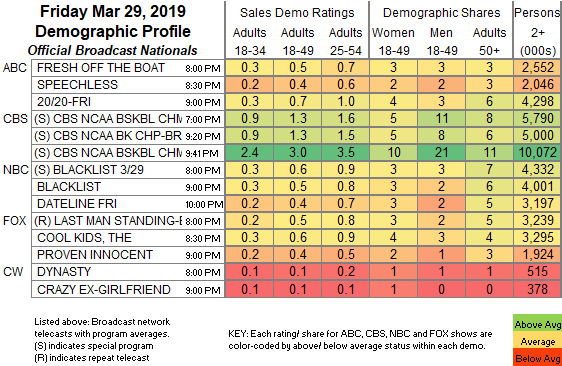 CABLE HIGHLIGHTS: Friday cable was dominated once again by the NCAA TOURNAMENT, with TBS now the sole cable carrier, and coverage led by the North Caroline vs. Auburn game at 1.65; TBS followed its basketball night with a 1:12AM episode of THE LAST OG at 0.29, and a 1:42AM episode of ELEAGUE at 0.19. A&E’s LIVE PD returned from a break at 0.67. HGTV’s MY LOTTERY DREAM HOUSE was steady at 0.28. HBO’s REAL TIME WITH BILL MAHER held at 0.27. Food Network’s DINERS, DRIVE-INS & DIVES lost 0.04 to 0.25. On MTV, RIDICULOUSNESS dropped 0.05 to 0.24. On We, MAMA JUNE: FROM NOT TO HOT ticked up to 0.20, and BRIDEZILLAS was steady at 0.09. Fox News’s TUCKER CARLSON TONIGHT narrowly led cable news at 0.20/0.35/2.7M, with MSNBC’s RACHEL MADDOW SHOW at 0.19/0.30/2.3M, and CNN’s CUOMO PRIME TIME at 0.11/0.14/800K. Bravo’s DON’T BE TARDY rose 0.03 to 0.19. Nickelodeon’s early-evening CRASHLETES was at 0.19. ID’s SECRETS OF THE MORGUE was at 0.18/0.16, compared to last week’s 0.20/0.17. Paramount’s BELLATOR LIVE was up 0.03 to 0.10. 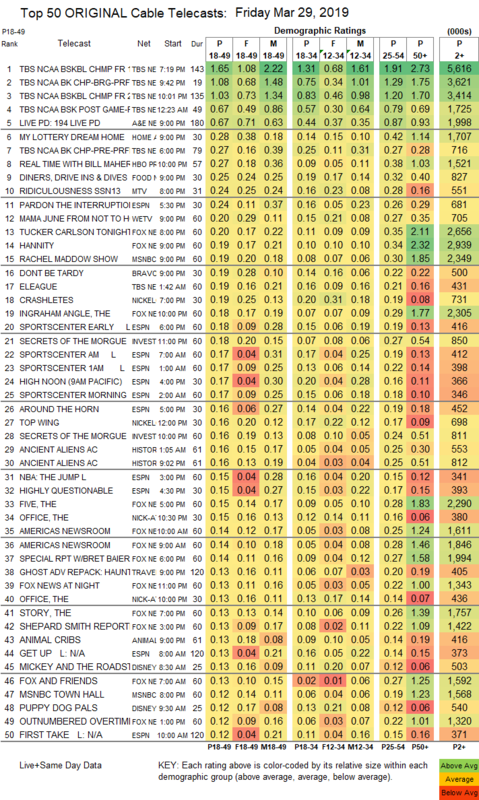 Cinemax’s STRIKE BACK finished its run off the chart at 0.03/133K.